The Source Four LED is here and the Lustr+ is a true full-color LED ellipsoidal. The PLPROFILE4 luminaire is a LED, variable-beam profile with precise beam control and pattern projection from a high output beam. The ProfiLED 150 Zoom by Spotlight is the hands down best price/performance value for any black box or small venue. RGBW color mixing; ZS model is 20-38 degrees zoom. 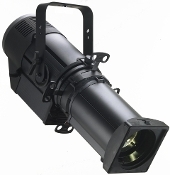 The Source Four LED Series 2 is latest LED ellipsoidal from ETC, brighter than the orginal Lustr+. The Source Four LED Daylight provides cool white that emulates natural daylight. The Source Four LED Tungsten creates warm spectrum light replicating conventional tungsten fixtures.